When I first began learning about gentle parenting, I spent a lot of time on parenting boards soaking up the experience and perspective of veteran moms. I noticed right away that the so-called terrible twos were viewed with nonchalance. Three, on the other hand? Many mothers who posted were overwhelmed, questioning everything they had ever tried and ready to throw in the towel on gentle discipline. Those who had passed safely to four and beyond, if they hadn’t blocked out the traumatic memories, responded with heartfelt commiseration. It is a tough age. Most of mine sailed through two fairly easily. Three was, ah, challenging. Right now, my precious little Klingon princess is three and a half. We are deep in the throes of all that it means to be three, magnified by her intense personality. Meltdowns? We haz em. The triggers vary, although for a month one of the biggies was any crack, hole or other imperfection in her food; for example, the tiny holes in a slice of bread that are created by the air bubbles during baking. Trying to explain that this is normal and the way it is supposed to look accomplished nothing. She still wailed and refused to eat it. After a morning of assorted crying jags, it was all I could do to not wail along with her. Three and a half year olds seem to be riding an emotional tidal wave of ups and downs. As frustrating as it is for parents, and as tempting as it is to ride that same wave, it has to be scary and overwhelming for the child. Have you ever had times when your emotions swept you away, you were crying or irritable and barely able to keep it in check? It is a horrible feeling, and being so small and having so little experience must increase that exponentially. We need to be an emotional safe harbor for them. If he screams that he hates you, you must have enough love and self-control for both of you in that moment. Three year olds are masters at pushing buttons, but it can help to reframe it as alerting you to your own needs for healing and growth that might otherwise be overlooked. First, stop blaming yourself. It isn’t because of your parenting that your child is having a rough time. Whether you punish or not, whether you have been securely attached or not, three and a half is still three and a half. Routine. I am soooo not a schedule person. For some of us, the whole idea of scheduling has taken on evil overtones because of the way some people want to force babies to conform to the clock. Rest assured, that is not what I am suggesting. Think of it as a predictable sequence of events. Three year olds often want to know what comes next. A picture calendar can be a great way of planning a day together. Limiting choices. Again, this can seem counter-intuitive if you have just made the whole paradigm shift of allowing your children as much power as possible. I am not suggesting that you disregard their feelings at all. Just be mindful of how much they want right now. Have you ever had a day when you were tired or anxious and even little decisions like what to wear or what to eat were almost too much? Choice can be exhausting. So on a rough day, it might mean that instead of asking them to choose, you select something that you believe they will like. If they don’t like it, then you can allow them to suggest an alternative. Snacks. Lots and lots of snacks. Three year olds spend tremendous amounts of energy, but you probably know that already. They need near-constant refueling. Many crave sweets around this age, but giving healthier, protein-based alternatives can help avoid blood sugar crashes. 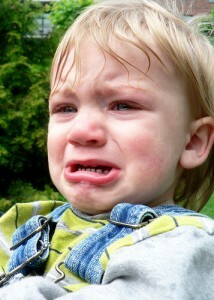 Also, some children respond to food dyes or allergens with crying or amped up behavior. Make sure that the snack isn’t actually causing your child to feel worse! Sleep. That in between stage of outgrowing naps is rough. All of my kidlets stopped napping by the time they were two, unless we had a particularly fortuitous car ride. But some days they still needed more sleep. You can try to move up bedtime, or offer a quiet time during the day, but you can’t make someone fall asleep, even when they are tired. Sometimes the best you can do is provide the opportunity and help them deal with the fallout if they miss it. Expand your toolbox. When they are babies, discipline is pretty easy–just love and nurture and meet their needs. As they grow older, it is important to remember that gentle discipline isn’t just about what you don’t do. If you don’t replace spanking, shaming or time-outs with other positive tools, it is dangerously easy to fall into a permissive/punitive pendulum swing from one extreme to the other–letting them do whatever they want until you get upset enough to snap. For loving, practical discipline tools, check out our Gentle Discipline Resources. Snuggles. When it seems like your little one is fighting against you (though she really isn’t), you have to fight even harder to maintain loving connections. Attention, snuggles or wrestling games, lots of loving words and little surprises (that do not have to purchased) are important to keep their love cups from leaking out. Three seems to be one of those make it or break it times for many parents in terms of gentle discipline. As a mom who has been on the other side, I can promise that it *does* get better. Let it drive you deeper into conscious, peaceful parenting. You can enjoy your three year old, really. Especially when she turns four. Seriously, even the most challenging days are still good ones when they result in stronger relationships. The energy and empathy that you lavish on your child now are worth it. ((((Hugs)))) Regina. I have felt the exact same way so many days! And I think you hit on something extremely important–consequences aren’t the answer. I have a couple of kids who would only dig their heels in harder if I tried to be their adversary. Just another reason why connection is so important. If we try to fight and coerce, they will fight back even harder, but if we respond with loving, connected relationship then we become a trusted ally to help them navigate this tough job of being small. Michele, that is a perfect description–just like a really bad month of PMS. I think that your gentleness and responsiveness are definitely helping, even if it doesn’t feel like it to you in that moment. Peace to you and your sweetie! Thanks for this article — my DS just turned one and it’s good to know what’s coming soon! I’ve seen several mentions of 3… being the new 2, etc. I’m a little scared because I’m not sure we’re going to survive 2! My DD is 2½ now. I try to avoid “no” and look at how things can be yesses or simply avoid the kneejerk no answer. I do feel like I can be a bit permissive, though. My husband definitely feels like I let my children (including my teenager) get away with murder. I like what I’ve heard from Alfie Kohn (admittedly, only a little), but am not sure even gentle “discipline” falls into his philosophies. I’ll be checking out some of those resource links. Thanks. It is tough to know where the line is, but I think your tips about finding ways to turn it into a “yes” are excellent! I definitely lean toward the unconditional parenting end of things, but so far I have not seen a conflict with discipline (in the sense of teaching, of course–not as punishment) and UP philosophy. oh thank you, thank you for this article! I want to add, it is worth having your pediatrician’s input on the matter. After much cajoling from my son’s school, I took him to see the pediatrician (I really didn’t think this was anything physical). After a blood test, it turned out he was anemic because calcium blocks the absorption of iron, and he ate yogurt all day long. Anyone who has ever had anemia knows it is very difficult to keep a lid on your emotions when you are exhausted beyond words, which is how he was feeling. Thank you so much for sharing that. My three year old also has some symptoms of iron deficiency, and I actually have a call in to her ped about it. It is always so important to pay attention to the ways that behavior is affected by physical issues! Thanks so much for this! My 3.5 year old has proven to be much more challenging than he was when he was 2. It is so nice to hear that this time is challenging for many others. Your tip on snuggles is my favorite. When he is in the midst of an intense time and I seem to be losing my patience, I often scoop him up, hug him and say “Can’t we just stop. Let’s just stop now and start over”. Sometimes I can feel his whole body relax as the intensity completely stops, other times it calms him down just enough to talk to me rather than yell, and no matter what it catches his attention, much like a spank would even though it’s the complete opposite. I read somewhere to try and really be with my child in his emotional state. I think of that often and really try to experience what he is experiencing in order to help him through it. Thank you for this. We just stepped into three and while some things are so much easier…some are SOOO much harder. I used to be so patient and thoughtful, but the last few months have been seriously trying. We went from a family of three to four and I’m tired and snippy. My older daughter has been AMAZING with her sister, but I’m sure she’s holding in a lot of stress that gets released all at once from time to time. When my oldest son turned 3 I was blown away. I told a friend of mine that I thought it was supposed to be terrible twos. She said, “Oh, it is, but they left out the rest… It is terrible twos, trying threes and finally four!” I remind myself that often now that our second son is 3! Thank you so much for this, I cant tell you how much I appreciated being able to read somehing that didn’t make me feel like a failure. My son will be 3 tomorrow and tonight there were so many buttons pressed I just wanted to pack my bags and leave.. Now I feel like I can regroup and start tomorrow afresh. Thank you..